There were two arson attempts this week at the Civitas building, the minister says, possibly linked to the fire at the Bank of Lisbon building in Joburg. There are deliberate acts to sabotage government buildings through arson, Public Works Minister Thulas Nxesi said today. 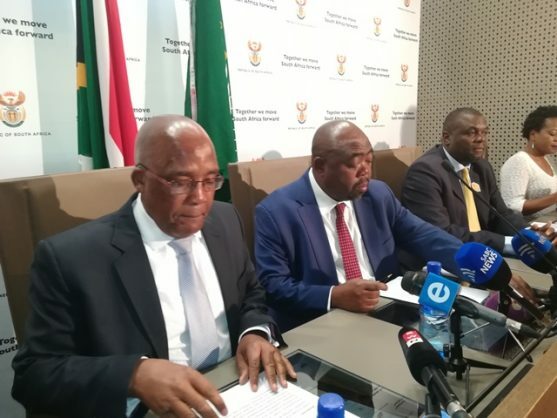 Nxesi was speaking at a media briefing in Pretoria, accompanied by Health Minister Aaron Motsoaledi. He said there were two arson attempts this week at the Civitas building – the national headquarters of the health department. The most recent incident was when the 14th floor was set on fire whilst there were still people in the building. “The alarms went off and staff were able to extinguish the blaze – otherwise the results might have been lethal,” he said. Nxesi said they have reported an arson attempt case at the SAPS. He said they suspected that this incident might be linked to the fire which claimed three lives of firefighters at the provincial government offices in Johannesburg this week. The building only had 21 percent level of compliance against the norm of 85 percent. There has been reports that the Civitas building is overcrowded with no air-conditioning or windows and a leaking roof. Nxesi said these media reports are an exaggeration. However, Nxesi, conceded that the building had been poorly maintained and this resulted in the malfunctioning of the air-conditioning. He said his department will look into the issues raised at Civitas. The Public Servants Association of SA will head to the Labour Court next week in an attempt to close down the building. “We appreciate to be taken to court so that it can be decided whether we are putting people’s lives in danger,” said Motsoaledi. An official from public works said a report on the compliance standard at Civitas was not available but they are still working on it.